Caption slip reads: "Photographer: Snow. Date: 12-22. Reporter: Scott. Assignment: Churches. 33-34: St. Ambrose Catholic Church, Fairfax at Fountain Ave. 57-58: St. Sophia Greek Orthodox Cathedral, 1326 South Normandie Avenue. (For Riblett)." Other caption slip reads: "Photographer: Rustan. Date: 12-25. Reporter: Scott. Assignment: Churches. Faith Lutheran Chapel & School, 85th St. & 11th Ave. 31-32-55-56-87: Exterior shots of church. 67-68: Hollywood Temple Bethel (exterior) at Fountain Avenue & Crescent Hgts. Blvd. 53-54: Van Owen Baptist Church, Morse Ave. & Van Owen Blvd. 59-60: Oneonta Congregational Church, 1515 Garfield Avenue, South Pasadena. 56-83-84-59: Wayfarer Chapel, Portugues Bend, exterior shots except #6 which was taken inside at back of chapel. 93-94-60: Wilshire Community Methodist Church exterior. 47-48: All Saints Episcopal church, Bev. Hills. 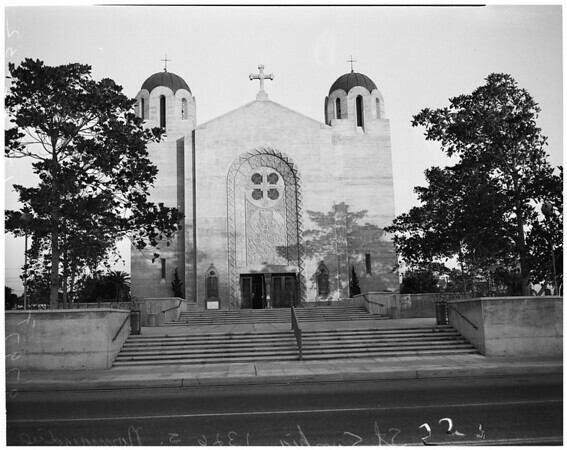 88-39-40: St. Francis Episcopal, Palos Verdes -- exterior shots of church."